I was asked just before Christmas to review a book called “The Ultimate Drop Box Guide” which I’ll be reviewing on Wednesday, but based on that I’d thought I’d take a brief look at other online file storage systems and their pros and cons. Note: Each of the Storage Providers I looked at needed to offer a free option to be considered for this list. For clarity, I personally use Google Drive and Dropbox (just so you know there is no bias!). 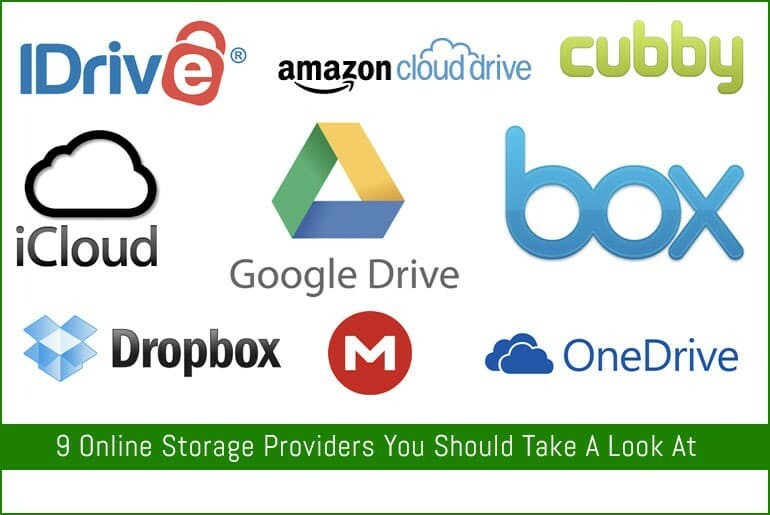 Why would you need cloud storage? If you’re transferring files between computers a lot, want to share photos taken on your phone with your P.C (or other people), or just want to free up space on your computer that’s where cloud storage comes in. Cloud storage isn’t a new thing, it’s just a new name for a service that has been around since the dawn of the internet. Some of these services though have added extra features other than just hosting files for you and it’s these I’m looking at today. If you have a Google account, you have access to Google Drive. You get 15GB of free space, but note that this applies across Google Drive files, Gmail and any photos stored in Google+. Drive allows you to view a lot of files directly through the web interface so you needn’t have the appropriate app installed on your machine. You can also upload EXE and VBS files for example which some providers may block due to them being a virus risk. Drive allows you to collaborate on documents and you have the ability to set access levels so you can have administrators, editors and viewers so there is a good level of control over what people can and can’t do. If you install the Drive App on your PC or Mac, it creates a folder on your machine that mirrors your online files. Clicking on a file will open it in your web browser so you don’t need any extra software installed. To upload a file you simply drag it (or save it) in your Drive folder. There are client apps available for Android and IOS so you can access and edit your files on the go. Recently, the Android versions of these Apps were split into their own separate versions so you’ll need to download an individual program for documents, spreadsheets and slides (I can’t speak as to the iPhone App). Editing on these is quite difficult (especially spreadsheets) so if you do a lot of work on your phone it may be worth looking at another file storage solution and editing the files in a more phone-orientated program. You can also automatically upload your photos to Google+ (Google are so determined to get us to use this aren’t they?) and it will organise them into albums for you (you can set them to private though). Thoughts: If you’re a Google Addict (like myself) then this one is for you. OneDrive is essentially Microsoft’s version of Google Drive. It offers the same 15GB free as Drive and, as with Google, if you have a Live Account (Hotmail, Outlook etc.) you automatically have access to a OneDrive Account. OneDrive comes with online versions of Word, Excel, OneNote and PowerPoint which have a similar functionality to the desktop versions. The Mac and PC App (it comes built in to Windows 8) again gives you a local folder that mirrors all of your online content, and dragging/saving files locally will allow them to be uploaded on the next sync (although reading the reviews, there seem to be some issue with syncing on a Mac). The Android App allows you to backup your photos and view/edit certain items however you’ll need a separate program such as Microsoft Office Mobile to actually edit any files properly. Thoughts: If you live in a Microsoft centric environment, then this one may be the best option for you. Unlike Drive and OneDrive, Dropbox is purely a file storage app – there’s no tool for editing documents within it, you’ll need an external program. You can however preview a variety of file types from directly within the web interface. Dropbox has clients for every major computer and operating system. It also comes pre-stalled on many Android devices, and is a “bundled” service with software like Avast Anti-Virus. You get 2GB of free storage, which isn’t a great amount of space when you think about it but you are able to increase this by sharing the app on social media, working through a series of criteria (such as linking your camera app) or get a deal via your phone provider (for example I got 20GB through HTC). Alternatively you can opt for the monthly payment option for more space. With Dropbox, once you’ve installed the app on your computer, a local folder is created. Anything dropped into this folder gets synced to your Dropbox account. You have the ability to share files with non-Dropbox users and also collaborate on documents. Note though however there are no restrictions on collaboration – everyone is an “administrator” and therefore can edit and delete files. There is a revision history though but it only lasts for 30 days. You can encrypt files and Dropbox has 2-factor authentication which is great if you’re security conscious or storing sensitive data. Thoughts: I use Dropbox as an addition to my Drive account. It enables me to backup all of the photos from my phone automatically. I can then delete these photos and free up much needed space on my phone while still keeping my blurry photos safe. Box is very similar to Dropbox – or should that be that Dropbox is similar to Box as it came first?! Box though concentrates more on the business users of file storage rather than personal users. You are able to get a personal account – and with that get 10GB of free storage so it’s got a lot more capacity than Dropbox if space is an issue. You don’t appear to get version control in the free version (unlike DropBox) but one interesting feature of Box is the ability to comment/annotate on files which could be handy when making revisions with a group of people. You can preview files online, send links to allow friends/co-workers access to download files, access your files through your phone although it looks like you may have to add a third-party app if you want to automatically back up your photos. Thoughts: If you need extra storage space over the initial 2GB that DropBox offers then this may be the app for you, although apparent lack of automatic camera uploads and version control may be a deal break for some people. We can thank iCloud for bringing the term “Cloud Services” to the general public’s attention. If you have an Apple ID – which if you own an iPhone, iPod Touch, iPad or use iTunes you will have (side note, why isn’t it Apple iD?!) – you can access iCloud although it’s important to note that you can’t run it on Android or Linux devices, and you need at least OSX 10.7.5 and Windows 7.
iCloud allows you to sync your contacts, calendar items, documents, email and photos (if you have the right version of iPhoto installed on your Mac) – it’s essentially a Mac version of your Google Account. You get 5GB of free space which isn’t a lot if you’re looking at sharing all of your photos and documents. To use a lot of the functionality you need to have OSX Mavericks and IOS 8 and to save documents directly to iCloud requires applications to have the functionality inbuilt into them so whilst I can save files with my copy of Word 2011 directly to Google Drive, OneDrive, Dropbox or Box I can’t save them to iCloud. Thoughts: I have to admit, considering I’m on a Mac, I’m really disappointed with the way that iCloud works with my version of OSX, but I guess this is part of Apple’s plan to always get us upgrading their hardware. Amazon may be thought of more for their book and DVD sales than their storage solutions, but they’re actually a big player in the online storage game with their AWS (Amazon Web Services) running lots of big, high traffic websites. With Amazon Cloud Drive, you get 5GB of free storage and automatic photo backup. If you’re an Amazon Prime customer you get unlimited photo storage and any photos taken with a Fire phone are stored for free. You can access your files through an Android, PC and IOS app. They’re currently working on a Mac app so if you’re running OSX you’re out of luck for the time being which may be a deal breaker for some. Additional Space is available but, compared to say DropBox which works out around £100 a year for 1TB, Amazon will charge you a whopping £320! Thoughts: If you don’t need a Mac app or much space (or don’t mind paying over the odds for it) then you might want to look at Amazon Cloud Drive, especially if you use a Fire device (T.V, Phone or Kindle). Cubby offers an interesting twist on file sharing and storage. You get 5GB free with a personal account but a 1TB pro account will cost around £560! It may be though, with Cubby’s unique feature, that you won’t even need to go over your 5GB limit. As well as offering you the 5GB online storage, Cubby also acts as a bridge between all of your registered devices allowing you to access files stored on each of them as if you’ve uploaded them to your Cubby account. This means that you don’t have to use your online storage although presumably the target computer will need to be on in order to access the files. Made my the makers of LogMeIn, Cubby offers an interesting new take on ways to share files between your own computers. If you want to share files with others, you can do that too and you get unlimited versioning so you can easily undo any mistakes. The app is available for Web, Android, IOS and Mac, note that there doesn’t appear to be any automatic camera roll backup included. Thoughts: Some of the features look quite interesting however I think if you’re going to go over the 5GB limit – which is relatively easy to do if you need to save larger media files – then the pricing options for the average user are bit on the high side. You’d think from the name that this is an Apple product but it’s not! iDrive works with Mac, PC, iPhone/iPad and Android and you get 5GB free storage space. One of the unique aspects of this product is that you get the functionality to backup your Facebook and Instagram photos. Another interesting function is that you can request a 3TB drive to be sent directly to you, you put all of your data on it and ship it back to iDrive and they load it into your account. You can then just incrementally backup all of your files! They offer increased space for referrals, but 1TB of space is only around £40 a year (excluding any special deals) so this makes it one of the more affordable solutions I’ve looked at. Thoughts: If you live in your Facebook and Instagram accounts, the backup functionality and low price of additional storage may make this the storage solution for you. Mega is borne from the ashes of MegaUpload which was shut down due to copyright infringement. The company took what they learned and moved into the cloud storage market. Accessible from mobile – iPhone, Android and Blackberry (do people still use those?) – and your PC/Mac/Linux machine you get a whopping 50GB of free space to play with. You can sync any folder on your Computer with the sync client but again, there doesn’t appear to be an auto back-up for photos on your phone but you can share documents through email, SMS and to contacts within Mega. Thoughts: If you don’t care about automatic backups of photos, but need a lot of space on the cheap then this is the perfect app for you. Are there any solutions that I may have missed? Which one of those listed above have you tried and would you recommend?